Roughly 85% of homes in Long Beach have hardwood floors, either visible or under carpeting. Either way, a hardwood floor is a treasure that deserves expert restoration if you have it...and expert installation if you want it. Carter Wood Floors applies the industry standard in hardwood flooring installation, finishing and restoration. Providing on site, custom refinishing and staining is their specialty. ...into this (left). And they handle everything from restoring existing wood floors to installing new ones. 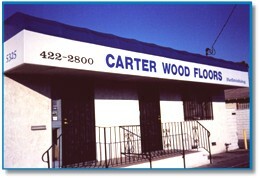 Carter Wood Floors has been producing satisfied customers since 1981. Referrals come from their customers...and have brought the LB based company over two decades of success and continuing new business. While other firms may accept work done on a piece work basis, Carter Wood Floors uses only hourly paid employees who spend the necessary time to ensure professional completion of projects and restoration. Hardwood floors are elegant, classy and invite a cleaner home environment. Carpeting can hold allergenic spores, dust mites, bacteria, fungi, animal dander and other unhealthy microbes that are dispersed every time you vacuum. And in addition to their quality of life benefits, hardwood floors make financial sense. They last a lifetime while the average carpet requires replacement every 10 to 12 years. If your hardwood floors look lackluster, they deserve a Carter Wood Floor professional refurbishing. You'll get a job done right the first time...and Carter Wood Floors guarantees its results. They're internet friendly, maintaining a robust web site at www.carterwoodfloors.com with welcome direct email contact at kevincarter@surfside.net. Carter Wood Floors is proud to be right here in LB at 5325 Cherry Ave. Feel free to call them at (562) 422-2800 or (714) 836-7050 (fax: (562) 422-6166).